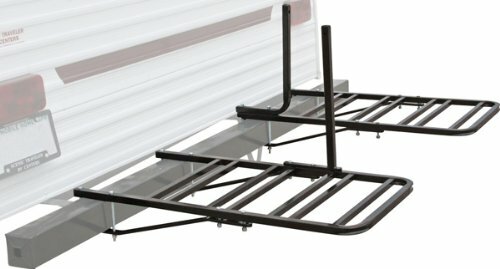 Tubular steel bicycle rack specifically for rear square tube styled RV bumpers to carry 1-4 bicycles. The 40″ L x 20″ W RV Bumper Bike Rack attaches to a 4″ -4.5″ RV bumper with one 6.5″ and one 8″ U-Bolt. Two, 26.5″ angle support brackets give the carrier extra added support when hauling a full load. Includes two “L” shaped 19.5″ supports for bicycle tie-downs and will work with bicycle tires up to 1.75″ wide. Maximum 140 lb. capacity.